Cherry Log Fire Station: a promise fulfilled? 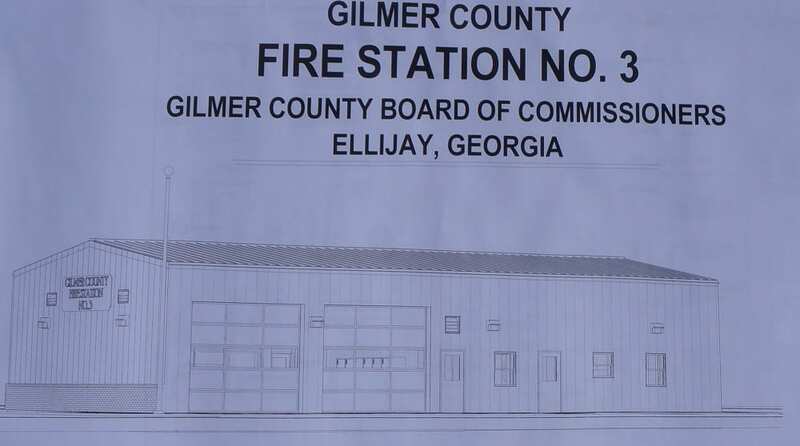 ELLIJAY, Ga. – Holding their groundbreaking ceremony over the weekend, Gilmer County has already spent months clearing land and preparing the lot on Pink Pig Lane for a new fire station. 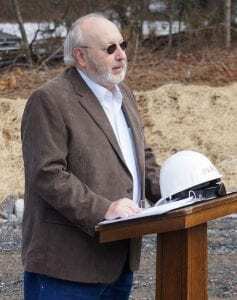 With a contractor moving forward, officials gathered together to formally break ground on the building’s construction. 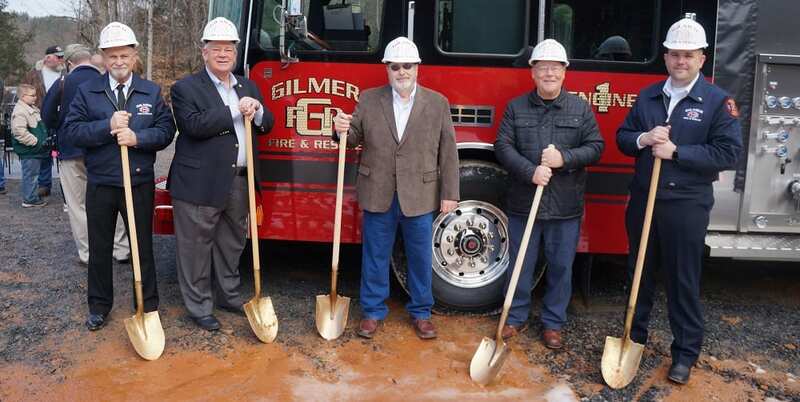 Georgia Speaker of the House David Ralston visited with Gilmer County Commission Chairman Charlie Paris, Gilmer County Post Commissioner Dallas Miller, and Gilmer Public Safety Director Tony Pritchett as they joined with local citizens to celebrate the project. 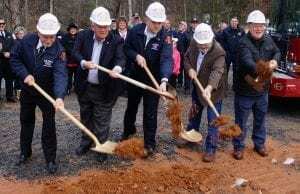 Officials turn the first shovel of dirt in the groundbreaking ceremony for Cherry Log’s Fire Station. With the original fire station in the area closed several years ago, citizens have continually expressed the importance of replacing it. A fire station in the area was promised but proved to be slow going. According to local resident Ernest Watkins, many of those in the area lost faith and didn’t believe the station would ever be built. Watkins told FetchYourNews (FYN) the station means everything to him as he had two sons who became volunteer firefighters and having the new location represents the culmination of his community coming together and being heard in what they are wanting. Opening the ceremony, Pritchett spoke on the importance of the project saying, “Community fire and emergency response capabilities for our citizens are the most vital and important services a local government can provide.” He went on to thank the current Board of Commissioners for making the project a priority and following through with the community through consistent hurdles and obstacles they encountered. Chairman Charlie Paris thanks Cherry Log residents for their patience in building the fire station. Paris thanked citizens for their patience in the project as he and the current board have worked through the trials and tougher points of completing it. The contract sets the station to be completed within six months from now. This sets the station to be open before next winter and available for any needs such as warming centers or shelters like any other station. Paris confirmed the new building will be a volunteer station and that the county already has volunteer firefighters planned at the location. The new location, dubbed Fire Station No. 3, will be an unmanned station that utilizes the volunteers to man the position. With the ceremony completed and construction underway, Paris said the next step will be preparing equipment and readying the transfer of that equipment to the facility. 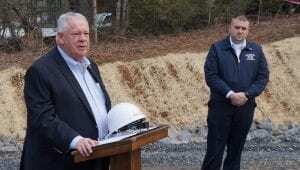 Public Safety Director Tony Pritchett, right, looks on as Georgia Speaker of the House David Ralston offers a few words for the fire station groundbreaking. Ralston praised the community’s efforts throughout the project saying he wanted to show his support for them. The “community spirit and pride” were what Ralston said laid the foundation. The fire station represents a “capstone” on their efforts locally. He went on to say he was very proud of the community and all they had accomplished. Moving forward, citizens will continue to watch the project progress through construction and paving, marching ever closer to finally completing a promise years in the making.